I spy with my little eye something that will NEVER AGAIN be removed by a wind developer in Ontario. An eagle nest. Over my dead body, NexTerror. When the community labels Nextera “NexTerror” and “NextError”, it isn’t for just any old reason. 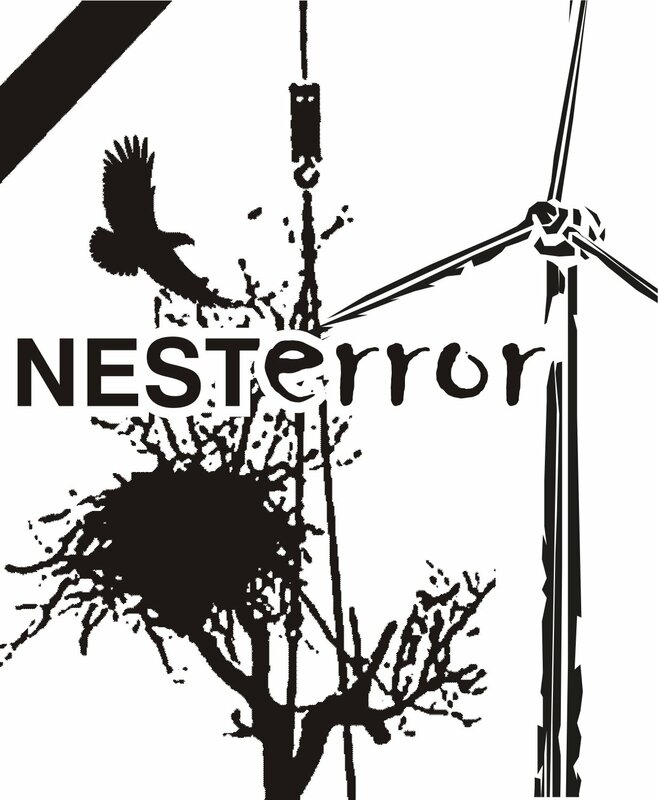 Perhaps parody is ingrained in Canadians, and this is why Nextera has earned itself yet another new name: NESTerror. We watched the take down of the eagle’s nest in Haldimand, and literally vowed never again. So this weekend some pictures of two bald eaglea and their nest were sent to me by a local resident. This nest is in the Nextera Bornish Wind Project (@ Kerwood Rd & Elginfield Rd), close to wind turbines (634m), and very close (187m) to the massive switchyard for the Bornish, Adelaide, Jericho and Cedar Point Wind Projects— a total of 221 turbines for Middlesex and Lambton counties. The Bornish and Adelaide projects are scheduled to be approved by the MOE this month. The Haldimand nest destruction was not a ‘one-off’, I’m sure of that, even though Nextera rep Tom Bird told us, “I absolutely don’t want to do that again.” Not even a month after they took down the nest in Haldimand county, they were eying up one in Middlesex county. Although I can’t find it anywhere in the document, I know there is another mitigation measure that involves just plain well removing the nest and letting the project ‘proceed as planned’. There is no trust/faith in the MNR or Nextera left out here. I’ve had people tell me, “I know where there are eagle nests, but I’m not telling the MNR!”. If they did, it would be like ratting out the eagles so that the wind developers can come and get them, displace them, remove their home. It’s kind of like we are hiding them from authorities…whether that is a good thing or not I’m not sure. Two turbines are within 800m or the nest, and that apparently is reason for concern (although not for Haldimand…?). I’m pretty sure eagles fly further than 800m from their nest, and if they fly south into this project….good luck with survival because there are 45 turbines to make their way through. During construction, monitoring of the eagle nest will follow the methods for the Behavioural Study (see pre-construction surveys) and occur for the duration that construction activities occur within the tertiary zone of the nest within the period of February 15th to August 15th, exclusive of March 1st to May 15th when no construction will be permitted within the tertiary zone of the active nest. Deterrents to prevent perching and roosting on the transmission line, as well as bird collisions with the transmission line (including power lines, static lines, guy wires, etc.) will be installed on all transmission line infrastructure within 800m of the nest, if active. Scenario 1: If the Activity Assessment confirms the nest to be active and the Behavioural Study is not conducted, the candidate Bald Eagle habitat feature BAL-001 and an 800m radius around the nest (see Figure 1) will be considered Significant Wildlife Habitat. As such, Turbines 2 and 3 will not be built and the alternate project layout presented in Appendix I will apply. Scenario 2: If the Activity Assessment confirms the nest to be active and the Behavioural Study is conducted, the candidate Bald Eagle habitat feature BAL-001 and the refined habitat zone based on information collected during the Behavioural Study will be considered Significant Wildlife Habitat. If Turbines 2 and 3 are not proposed within this refined habitat, then they can be constructed and appropriate construction and operational mitigation outlined in this Table of the EIS (Table 4) will be applied. Scenario 3: If BAL-001 is deemed not to be significant based on the results of the Activity Assessment, then Turbines 2 and 3 will be constructed and no mitigation or postconstruction monitoring (avoidance/disturbance) is required. Results of preconstruction surveys and final habitat boundary delineations will be provided to MNR prior to any of the three scenarios being acted upon. Perhaps this is why Nextera sent me a cease and desist letter, telling me to remove the Haldimand nest take down video, and the interview of the wind company afterwards. It’s a good way to squash citizen reporting and keep the record clean for them. They must know that if they go near this nest with the intention of destroying it, they are waging out and out war with the residents in Middlesex and Lambton, and probably across the province. Posted on April 25, 2013, in Adelaide Project- NextEra, Bornish Project, Environment, Ethics, Jericho Project, Ministry of Natural Resources, Next Era. Bookmark the permalink. Leave a comment.